Stevan Kirschbaum speaks to USW 8751 members and supporters following his arraignment, July 14. 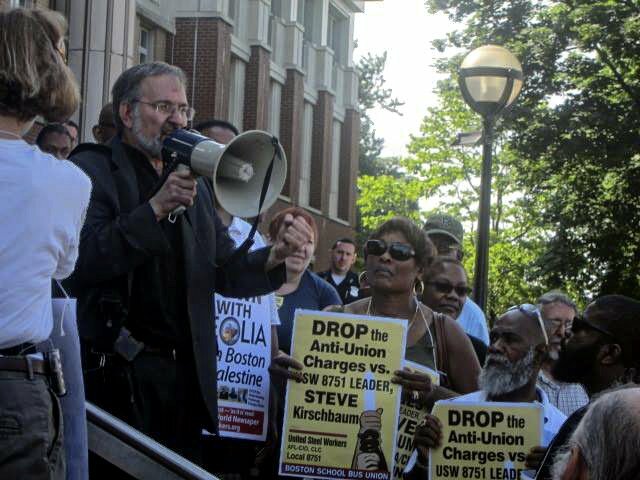 On July 14, over 150 school bus drivers, elected officials, community supporters and political allies occupied the steps and chambers of the Dorchester District Court in Dorchester, Massachusetts to demand the dismissal of the outrageous frame-up charges against United Steelworkers Local 8751 founder and Chair of the Grievance Committee Stevan Kirschbaum. 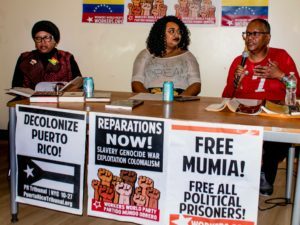 The Boston police stated in its report that the union’s Solidarity Day III June 30 rally that ended in a break room in Veolia’s Freeport Bus Yard involved violent, illegal entry. When the members simply exercised their contract right stated in Article 15 to hold a union negotiations briefing in this room. The front gates and doors were unlocked and opened. The Drivers Room was used by the members throughout the day and evening until all had left at the close of Solidarity day. Veolia Management’s unsuccessful attempts to prevent “union activity” in the Drivers Room constitutes yet another violation of the union contract and Unfair Labor Practice under the National Labor Relations Act. People’s lawyer Barry P. Wilson told the crowd after the arraignment that the charges are entirely false. They are just another Veolia/City union- busting tactic. Kirschbaum was served with a summons on July 3. He was not arrested on four felony charges of assault and battery with a dangerous weapon, trespass, breaking and entering to commit a felony and malicious destruction of property. Having Kirschbaum in the dock in Dorchester District Court for an arraignment was meant to be the coup-de-grace of Veolia’s campaign to crush Local 8751. However, the judge — who could have arrested Kirschbaum or set a high bail — released him on his own recognizance. 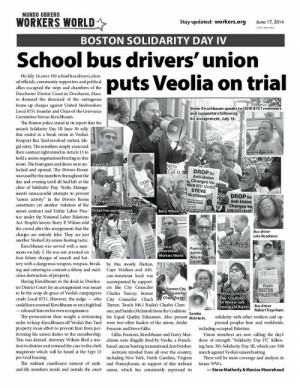 The prosecution then sought a restraining order to keep Kirschbaum off Veolia’s Bus Yard property in an effort to prevent him from performing his union duties to the membership. This was denied. Attorney Wilson filed a motion to Dismiss and remand the case to the clerk magistrate which will be heard at the Sept 15 pre-trial hearing. The militant courthouse turnout of rank-and-file members inside and outside the court by this mostly Haitian, Cape Verdean and African-American local was accompanied by supporters like City Councilor Charles Yancey; former City Councillor Chuck Turner; Touch 106.1 Radio’s Charles Clemons; and Sandra MacIntosh from the Coalition for Equal Quality Education. Also present were two other leaders of the union, Andre Francois and Steve Gillis. Gillis, Francois, Kirschbaum and Garry Murchison were illegally fired by Veolia, a French-based, union-busting transnational, last October. 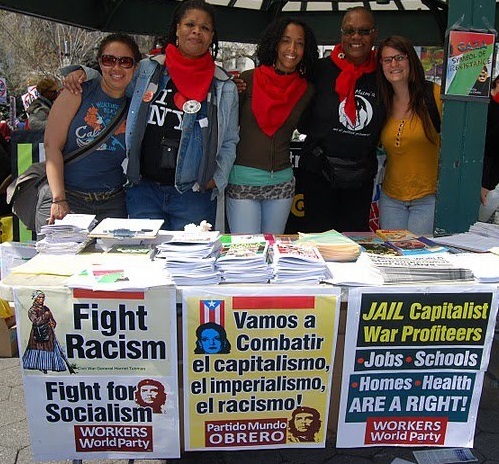 Activists traveled from all over the country, including New York, North Carolina, Virginia and Pennsylvania, in support of this militant union, which has consistently expressed its solidarity with other workers and oppressed peoples here and worldwide, including occupied Palestine. Union members are now calling the day’s show of strength “Solidarity Day IV,” following June 30’s Solidarity Day III, which saw 500 march against Veolia’s union busting. 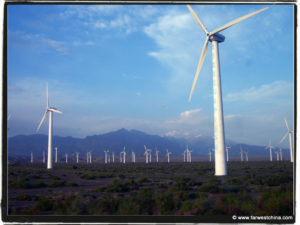 There will be more coverage and analysis in future WWs.